When the Sun Comes Up, You'd Better Be Running! No matter how big or small our battles may seem to others, for each of us they are important and can sometimes feel overwhelming. I am often asked if there is a way to gain perspective and clarity? I myself think about this on more than a few occasions throughout the day. Finding peace, serenity and clarity take more than facebook posts of catchy phrases, philosophies and quotes (like the one I posted at the top of this page). Trying to "figure it out" in the moment can also be a recipe for disappointment, especially if your already overwhelmed. True peace and serenity is about developing habits that bring serenity, clarity and peace. Something I call Foundational Grounding. Read Inspiring Stories, Watch Inspiring Movies, Etc. Legacy: What are You Leaving Behind? I'm sure you can think of numerous other things to add to this list. I'll leave that up to you. My point here is that much like staying healthy is a path that requires maintenance. It's easy to see that if someone is over weight they don't just make the decision one day to be skinny and then "ZAP" like magic they are! No, you are going to have to work at it now (and for a while) and then later you will see the results of your work. In order to maintain and keep your weight down you have to continue to keep an eye on what you're eating and how much exercise you're getting. If you don't you'll probably begin to notice that your pants are getting tight again. To continue to stay healthy you have to work at maintaining this new habit. Creating a lifestyle that supports the healthier you rather than "binge dieting" is more healthy and effective. Your mental and emotional health is no different. We all know what it's like to be around someone who is up lifting and positive. These are people who when you are around them you feel at ease, good, positive, safe. After time with them you somehow feel better about yourself and the world around you, even if nothing much was said between the two of you. We have also been around emotional vampires, crab-asses, overly paranoid prep-ers, bullies, people who steal your energy, people who you feel worse after being around them. Many of these people don't even realize how bad they are. They are fighting their hard battle as well. It is your choice whether you want to spend time with them. It's your choice if you want to be like that. Use adversity as an opportunity to make the decisions you need to make to both navigate the situation as well actualize your life to the highest degree. 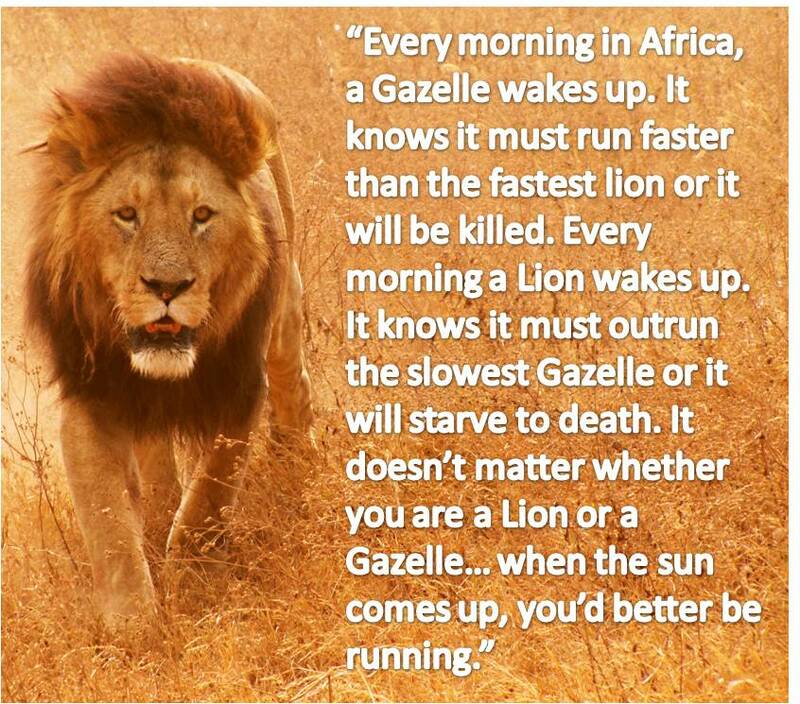 Remember every morning when you wake up don't only be ready to run, be ready to turn adversity to an opportunity. It's your CHOICE! Choose wisely because either way, you reap what you sow. Here we are on the FRONT PAGE of the Trentonian (www.tentonian.com) as they reported on the September workshop that we taught out in New Jersey. If you are wondering who WE are, I'm referring the work I do with Jack Hoban's organization: Resolution Group International (RGI). Click HERE for names and more RGI info. We once again had the privileged to work with police officers from about 11 different departments from New Jersey and New York (not to mention my fellow RGI com-padres who it is always great to see and work with). Everyone in the apartment complex where I lived knew who Ugly was. Ugly was the resident tomcat. Ugly loved three things in this world: fighting, eating garbage, and shall we say, love. Ugly always had the same reaction. If you turned the hose on him, he would stand there, getting soaked until you gave up and quit. If you threw things at him, he would curl his lanky body around your feet in forgiveness. Whenever he spied children, he would come running, meowing frantically and bump his head against their hands, begging for their love. If you picked him up he would immediately begin suckling on your shirt, earrings, whatever he could find. Ugly lay in a wet circle, his back legs and lower back twisted grossly out of shape, a gaping tear in the white strip of fur that ran down his front. As I picked him up and tried to carry him home, I could hear him wheezing and gasping, and could feel him struggling. I must be hurting him terribly, I thought. Then I felt a familiar tugging, sucking sensation on my ear - Ugly, in so much pain, suffering and obviously dying, was trying to suckle my ear. I pulled him closer to me, and he bumped the palm of my hand with his head, then he turned one golden eye towards me, and I could hear the distinct sound of purring. 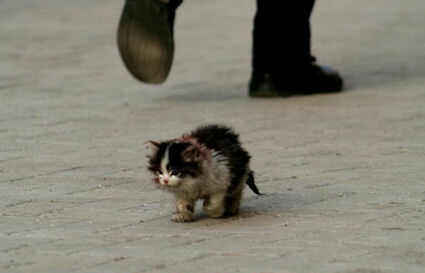 Even in the greatest pain, that ugly battled scarred cat was asking only for a little affection, perhaps some compassion. Ugly died in my arms before I could get inside, but I sat and held him for a long time afterwards, thinking about how one scarred, deformed little stray could so alter my opinion about what it means to have true pureness of spirit, to love so totally and truly. Ugly taught me more about giving and compassion than a thousand books, lectures, or talk show specials ever could, and for that I will always be thankful . He had been scarred on the outside, but I was scarred on the inside, and it was time for me to move on and learn to love truly and deeply. To give my total to those I cared for. As many of you who follow me and/or train with me know about Jack Hoban and Resolution Group International (RGI). Well, here is an article that the Trentonian did on the last workshop that we taught out in New Jersey. I had the privileged to work with police officers from about 11 different departments from New Jersey and New York (not to mention my fellow RGI com-padres who it is always great to see and work with). SPRING LAKE — Nationally, the names Michael Brown, Rodney King and Eric Garner are synonymous with police brutality; while locally, the names Lael Queen, Michele Roberts, Darrell Griffin and Tyrell Green remind residents of excessive force. It seems like just about every week there’s a media report about a law enforcement official who’s accused of making an unethical decision. The most comprehensive stats regarding police misconduct were last compiled by the Cato Institute in 2010. A Cato spokesperson said last week that current resources don’t allow the opportunity to produce comprehensive statistical reports. But the organization publishes an online daily newsfeed of reported police misconduct incidents from around the country. According to the website, between the 13th and 18th of this month, 35 new allegations of police misconduct were reported. One of those incidents occurred in New Jersey and three occurred in Pennsylvania. Last week, The Trentonian uncovered court documents alleging that a man suffered a stroke because Trenton Police refused to allow his family and friends to provide him with required medications. Donyell Knight informed officers of his medical needs at the time of his arrest, during processing and while incarcerated, court documents state. Then, about three days after his arrest, Knight suffered a stroke while in jail, but was still denied medical treatment, according to court documents. Knight and his wife are now suing the Trenton Police Department, the City of Trenton, the Mercer County Sheriff’s Department and the Mercer County Correction Center. There’s no doubt that these type of incidents have led to some degree of distrust in law enforcement. Pew research published last month revealed that 68 percent of people under the age of 50 say that police departments do only a fair or poor job using appropriate levels of force, while 29 percent of that age group say police do an excellent or good job. People ages 50 and older are less negative in their views of law enforcement. The research also shows that there are large racial gaps in opinion of local and national police performance, with blacks being more critical of police than whites. 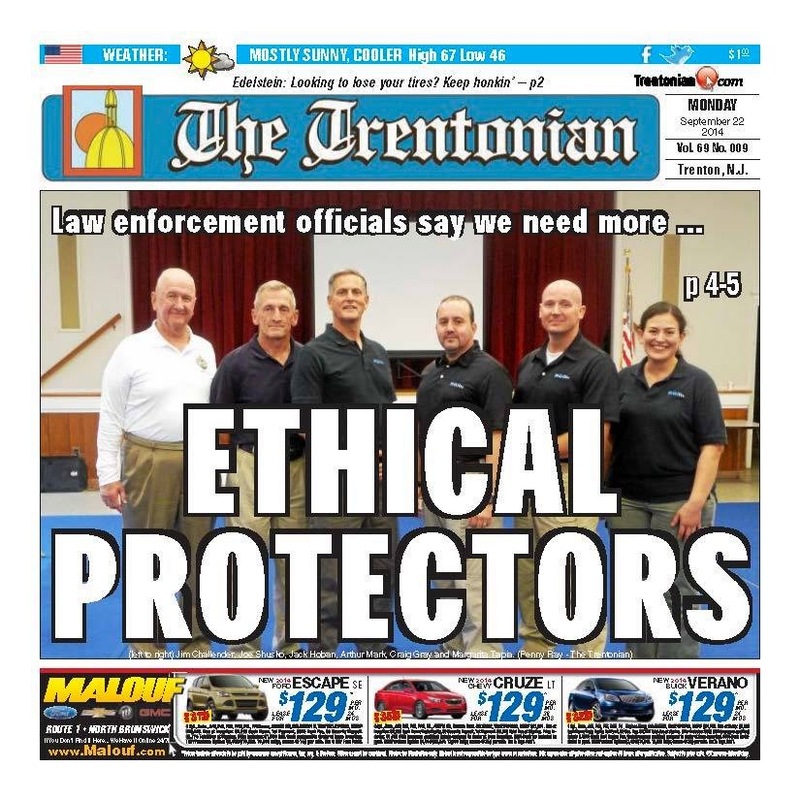 The Trentonian spoke with police officers from several departments in and outside of Mercer County for this story and all of them said they received some form of ethics and communication training in the academy. But ongoing training in those areas are not mandated, they said. Every officer interviewed said their agency mandates yearly requalification in firearms, as well as training on how to control the use of excessive force. Although most NJ law enforcement agencies provide some type of in-service training in communication skills and ethics, the officers said, yearly participation in the courses after academy graduation is not mandatory. Law enforcement veterans say that many officers experience burnout after a few years on the job, which tends to lead to unethical behaviors. Some veterans, though, have recognized this fact, and there is a movement behind the scenes within law enforcement to address the issues that lead to police misconduct. Last week, 30 law enforcement professionals from 11 different agencies gathered on the shore to participate in RGI’s Ethical Protector course. Some of the officers, including two state troopers, were directed by their superiors to attend the course and report whether RGI’s techniques and curriculum should be incorporated into their agency’s training. Others, though, were sent by insurance companies. Personnel from the Passaic Police Department, NJ State Police, Atlantic City PD, Perth Amboy PD, the Monmouth County Park System, the U.S. Marine Corps and NYPD were among those who attended the three-day seminar. One individual traveled all the way from Switzerland to evaluate the course and determine whether it could be used by police and military in that country. Over the course of three days, the men and women were taught verbal communication skills, physical self confidence and ethical clarity. A Trentonian reporter attended the last day of the seminar and spoke to several law enforcement professionals, some of whom asked to have their name left out of this story because they were not authorized to speak on behalf of their department. Many of them, though, were willing to share their personal opinions about the course. All of the people interviewed had nothing but positive remarks about the program, and the officers appeared rejuvenated, with a renewed focus and commitment to ethical policing. The men and women were taught the Verbal Defense and Influence methodology of conflict communication, which emphasizes the advantages of speaking to citizens and suspected criminals with respect. Retired Trenton Police Detective Edgar Rios also recommends speaking to suspects in a respectful manner. Rios — who is one of the most respected officers in Mercer County, not only for his knowledge of the job, but also for his calm approach to policing­ — suggests that officers empathize with the people they encounter. Rios did not attend the seminar, and he has never heard of RGI. He shared his comments via email last week. The seminar also taught methods of cross-cultural communication that foster respect even if the officer doesn’t know every nuance of the culture. RGI, in fact, spawned from Hoban’s work with the Marine Corps’ Martial Arts Ethical Warrior Program, which was tasked with training soldiers how to “win the hearts and minds” of people living in other countries. The seminar attendees were also taught various martial arts maneuvers that were aimed at disarming individuals who physically challenge officers. The maneuvers, though, were not necessarily the types of moves that could injure a person. They were disarming techniques meant to protect the officer and the suspect, and they were taught to be used as a last resort in convincing a person to comply. Attendees were also instructed on how to speak to the suspect in a respectful manner after disarming and placing them in handcuffs. One particular block of the seminar emphasized the importance of teaching something to someone every day, learning from someone every day and smiling when interacting with others. Attendees were also reminded to treat everyone as equals. On the last day of the seminar, the attendees participated in team building exercises where they learned how to improve physical fitness by using another person’s body weight. The exercises were suggested as ways that law enforcement partners could maintain fitness, while increasing their humanly bond, in just 10 minutes a day. Physical fitness also clears and refreshes the mind, they were taught, which helps maintain ethical clarity. Detective Shanahan is a hostage negotiator for the New York City Police Department. He attended last week’s seminar on his own time. Retired New Jersey State Trooper Jim Challender was the keynote speaker at last week’s seminar, and his message was a reminder to always “do the right thing.” In 1972, Challender uncovered a money laundering scheme involving top state officials as well as several politicians connected to the national Watergate scandal. Trentonian editor F. Gilman Spencer won a Pulitzer Prize in 1974 for a series of editorials about corruption in New Jersey’s state government that lead to a federal investigation. Those editorials included accounts of Challender’s findings. Challender said he later created several courses that trained troopers in police professionalism, cultural diversity and self-defense. The Trentonian obtained a copy of the police academy curriculum that Mercer County recruits will advance through over the next 21 weeks. The training includes several communication and ethics classes such as Conflict Resolution Crisis Intervention, Cultural Diversity, Arabic Culture, Basics of Community Oriented Policing, Morals and Ethics, Awareness of Emotional Reactions and Handling Individuals with Special Needs. It’s not exactly clear whether those courses are also offered as continual in-service training to refresh officers on the concepts. The academy’s website only lists the upcoming in-service courses that are scheduled through next month. But according to academy Director Al Paglione and Trenton police, the only refreshers that are mandatory to complete every year are firearms requalification and training on how to control the use of excessive force. Perhaps that will soon change. “We need more ethical protectors,” Hoban said. Penny Ray has worked in media for the past 14 years. His career began in radio broadcasting, and most recently he served as editor of Homicide Watch D.C. Reach the author at pennyray@trentonian.com or follow Penny on Twitter: @Penny_Ray.